This time it comes to our point 60 Bladder Meridian, called Kunlun and translates as The Olympian. This also belongs to the calls "The Twelve Heavenly Star" and its stimulation is especially recommended for when you have any type of pain, thus being one primarily analgesic point. As the Bladder channel runs along the back of the body, which begins in the hole that is next to the lacrimal, through the top of the head to the neck, and descending after the back and back of the legs to the little toe, this point is also indicated for torticollis, tension in the shoulders and back, for cramps in the extremities, inflammation of the knee, lumbago and sciatica. It is also effective for treating sore eyes, for nasal bleeding and epilepsy. 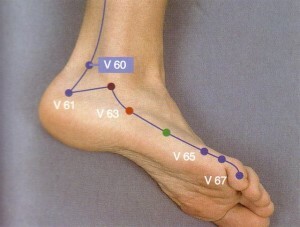 To locate this point, as seen in the image, is on the imaginary line separating the lateral malleolus (the ankle bone) Achilles. For clarity you can follow the instructions of the video below.